Details of the fourth major ‘Right2Water’ protest have been confirmed this afternoon. ORGANISERS WITH THE ‘Right2Water’ anti-charges umbrella group say they’ll be able to cater for an attendance of up to 100,000 at the next planned ‘day of action’ on Saturday week. The demo, set to get under way from 1pm on 21 March, will be the fourth major national protest against the charging regime. At a press conference in Dublin city centre this afternoon, Brendan Ogle of the Unite trade union said he expected the event would be shorter than the last major protest outside the Dáíl in December. Speeches at the main focal point – the Parnell Square end of O’Connell Street – will last around an hour, he said. “So we believe, from the social media, which is how we try to gauge these things, that there is no major downturn in the anger in this campaign, so we think there will be tens of thousands of people. There will be three assembly points for the demonstration, Des Fagan of the CPSU said. It’s planned marchers will assemble at Merrion Square, Connolly Station and Heuston Station, before converging on O’Connell Street for the main proceedings. Major traffic diversions will be in place in Dublin city centre next Saturday as a result. The main protest is expected to wrap-up by around 3pm. 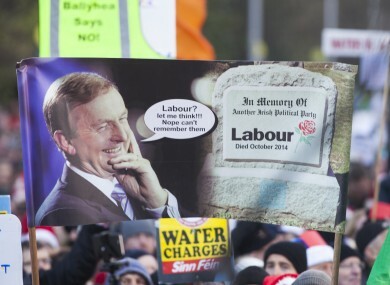 The five trade unions associated with Right2Water are planning a two day conference at the start of May, which they say will “discuss a set of core principles which will underpin a platform for renewal in advance of the next general election”. Politicians, academics and NGOs are being invited to contribute, the unions say. Asked whether a new political party could emerge from the movement, Ogle and Mandate General Secretary John Douglas played down the suggestion. “We are the umbrella group for a myriad of local community groups, political parties and non-political parties and people who aspire to create political parties,” Douglas said. “In terms of the Right2Water group itself. We won’t be forming, ourselves, a political party – but there may well be groups affiliated to the Right2Water campaign who will choose that path. Meanwhile, marchers at Saturday week’s rally will be joined on the day by anti-racism marchers taking part in the ‘M21′ march to mark UN Anti-Racism Day, organisers confirmed this afternoon. Email “Organisers of the next Irish Water 'day of action' ready for 100,000 turn-out”. Feedback on “Organisers of the next Irish Water 'day of action' ready for 100,000 turn-out”.